How does it feel to score an amazing four kills? It’s a number I never expected. Since my team was behind, I was planning to do my best to make it easier on Polt. This thought helped me through the games and made the four kills possible. You must be even happier to have done this in the GSTL. I am exceptionally happy. I think the fact I was able to achieve something like this in the best Starcraft 2 Team League earns me some recognition. Even within the team, my performance today was impressive. I’m glad I’m starting out well unlike last season. You are unstoppable lately. What’s the secret? No secret, it’s all thanks to the Zergs on my team. We talk among each other a lot and try to reinforce each other’s play. I can’t take all the credit. He was on a roll after three kills but actually seeing his play, I was under no pressure. I felt that if I concentrated and saw through his play, I could win. It seemed that he had a penchant for burrowed infestors so I had overseers ready in time. Your most difficult match today? It was the game against Moon. I made a mistake preparing against zergnling runbys. I wasn’t warmed up since it was the first game. Still, I was able to win by defending well against the infestors. The rest of the games were no trouble. There was no crisis at any point. If that’s true, I am grateful. I’ve never thought about it like that in the games. I just always try to show the same level of play as I do in practice. I think winning in Code S is an appropriate gesture of gratitude to such evaluation. There’s the fact that I lost to him both in the last GSTL and in a recent online tournament. 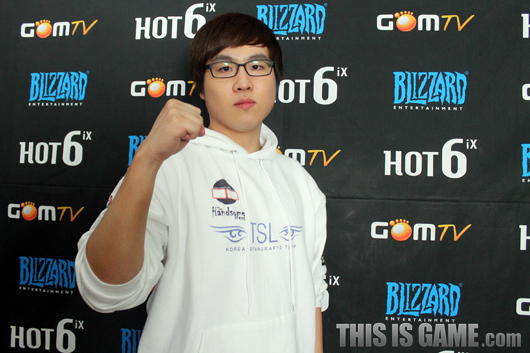 On top, he’s a GSL champion. Of course, I want to take him on. Will you prepare for MVP? I won’t ignore other players on IM. However, I think I should in case I face him. GSTL is a best of 1 format so I think I stand a better chance compared to a longer series. The recent patch was favourable for Zerg so I would say it’s 6:4 in my favour. How well do you want to do in this GSTL? My team’s performance comes before my own. I want to try for the most kills award but my team’s victory comes before my own so I’ll listen to my coach’s instructions. Firstly, I really want to make Round 2. Getting eliminated in Round 1 makes it too boring for me(laugh). I want to thank my coach who believed in me and sent me out today. I also want to thank my parents and my older sister who cheer me on from home. Recently, my team has had great teamwork. I want to thank my teammates also. Our team will become even better in the future so I ask the fans to keep supporting us. Since my team was behind, I was planning to do my best to make it easier on Polt. Woop, Team Polt fighting. Thanks as always, mate. I'm guessing the online tournament he was talking about is Iron Squid. Hey it doesn't hurt to have confidence, I wouldn't consider it an upset if he beat Mvp in a bo1. Kid is good at Starcraft. I didn't know before that MVP beated Symbol almost everytime they played. They have only played four games. Mvp won a bo1 in the gstl last season vs him and 2-1 in the online stages of Iron Squid, not a lot of history really. oh... i mistranslated because I didn't know this context. Symbol meant both GSTL and a recent online tournament. I was definitely cheering for TSL, but it was cool to see Moon do well. Really excited for the next match. MVP is good, but just because he just won a GSL (in a season with almost no zergs) doesn't mean he's actually that favoured in a GSTL bo1 against Symbol. The case with MVP is that GSL is HIS format. TSL is so scary now. MVP performed fairly well in the GSL back when the groupstage was bo1 games, so it's not a format he's a complete chobo in :-). Regarding Symbol I'm just happy he's showing good games and even better Moon finally starting to win games again. Hopefully I'll see a lot to both of them in the near future! Symbol is an awesome guy!